Hidden Capture - program to capture screenshots in stealth mode. This free app is not displayed in the system tray and can secretly take pictures of the screen you through a designated period of time. The program is easy to use and will not cause problems even for novice users. The Hidden Capture settings you can specify from which part of the screen to make a screenshot - the entire screen, active window or fixed working area. It also supports the ability to set the interval between the capture of screenshots, configure the rule to avtopereimenovaniya pictures, play sound and more. Hidden Capture is a lightweight Windows application built specifically for helping you capture your screen activity to multiple image files. It runs on a stealth mode on your computer, so other users cannot detect its presence in the system tray. Plus, it offers support for a master password for making sure no one can access, modify, or uninstall the program. The tool gives you the possibility to take screenshots in a full screen mode or capture active windows, automatically take snapshots at a user-defined time, and specify the saving directory. By default, the utility exports the images to JPG file format. What’s more, you can make the utility hide itself and wait for your command, start or stop the capturing task, create a slideshow with the images that are taken during the capturing process, as well as restore the program’s shortcut and capture the desktop or active windows using hotkeys. Hidden Capture lets you run the tool at Windows startup, capture the mouse cursor, apply grayscale effects, save the snapshots to the application’s path, and pause the capturing operation when the screensaver is activated. Other notable characteristics worth mentioning are represented by the possibility to play sound notifications when you start or stop the process or on any capture, and set up auto-naming rules for filenames (e.g. date and time, prefix and suffix). 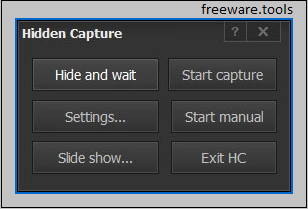 All in all, Hidden Capture provides a handy set of parameters for helping you take multiple screenshots in a hidden mode. Thanks to its intuitive layout, it is suitable for rookies and professionals alike.